Be sure to check out Syfy Channel's a 14 minute preview of the TV show! 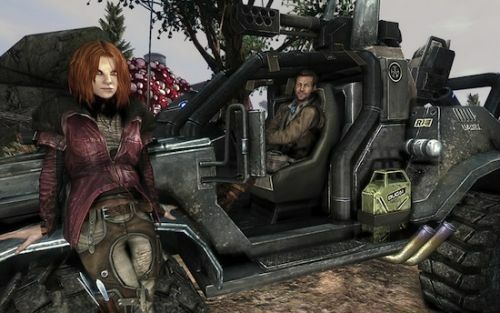 Defiance’s beta is now over, and so far gamers on all platforms are pretty pleased with what they’re given. While Trion Worlds getting as much feedback as they can from the players, those who were without beta keys may turn to many different videos for building hype. We are given a brief launch trailer, a short clip of the television show, and another Ark Hunter episode to keep us satisfied until the Tuesday launch. Along with the short trailer above, a 14-minute sneak peak of the Syfy Channel’s Defiance TV show (officially beginning on April 15th) was aired yesterday, which directly connects to the MMO game by the choices made by the community. Episode Six (eight in total) of Defiance’s “Ark Hunter Chronicles” series has also released, titled: “Vanishing Commodities”. These episodes are primarily there to introduce many of the characters in game and establish their battle-ridden world, promoting both the game and the TV show. To watch the previous episodes, do check out Defiance’s Youtube channel here. Defiance is set to be release next week on April 2nd on most major platforms, so do stay tuned for more info from us on our thoughts on the co-op aspects.